Apple just recently reported their Q3 financials. Although it was below analysts’ expectations, Apple’s financial statement showed an interesting trend for the Cupertino company. Stuart Carlton put together the following graphs outlining a trend of iDevices (iPod, iPhone, and iPad) taking up more and more of Apple’s total revenue. 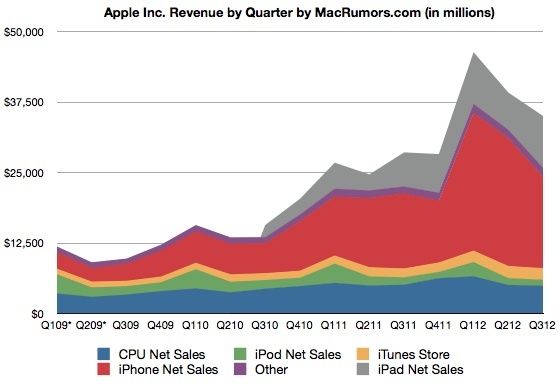 As the first graph illustrates, the iPhone itself accounts for nearly half of Apple’s total revenue. Combined with the iPad, the two product lines accounted for 72.6% of the revenue in the quarter ending June 2012. This is despite the fact that customers are holding out on purchasing an iPhone with the impending iPhone 2012 edition coming out later this year alongside iOS 6, which has been allegedly leaked. The leaked pictures shows the larger screen and 19-pin dock connector. At first glance, it looks like an elongated iPhone 4/4S with its headphone jack at the bottom. Needless to say, the “iPhone 5” (I’m still calling it “new” iPhone or iPhone 2012 edition) will be a fairly large makeover and will mark the first time Apple has increased the screen size of the iPhone. On the flip side, iPad sales beat out analysts’ expectations. The education and business sectors in particular are migrating to the tablet space. Mansfield, Texas, purchased 11,000 iPads alone for faculty and students. My parents just recently bought an iPad 2012 from Target and are enjoying their first official iDevice. It seems many people are opting in to the tablet form factor for the ease of use. My mom in particular enjoys it because she can easily power it on to check e-mail and web pages instead of waiting for her Windows Vista laptop to boot. The booming tablet market is not only good news for Apple, but also for its main competitor: Android. Google’s recently released Nexus 7 saw a huge surge in demand and sales. The 16 GB version, which sales for $250, is currently out of stock on Google’s Play Store, although the 8 GB version is ready to be shipped. Many customers swarmed to retailers to buy the tablet ahead of Google shipping out preorders. Amazon is also looking to release further iterations of its popular Kindle Fire. 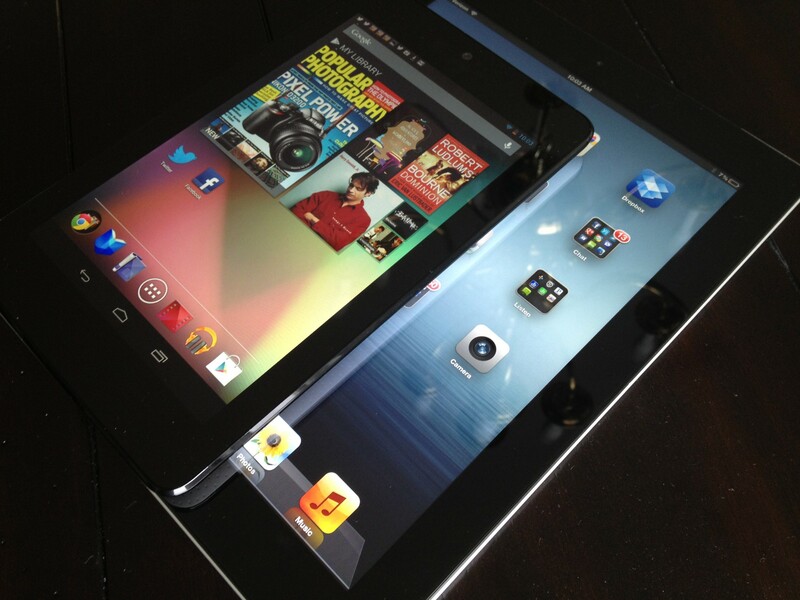 It looks like Apple is going to have quite a bit of competition in the tablet space. Whether or not its 68% market share is in danger from Android’s 29% market share is still a question that remains to be answered. As seen in the above two charts from MacRumors and WingsOfReason.com, iDevices account for most of the revenue for Apple with a significant downward trend of non-devices over the years. 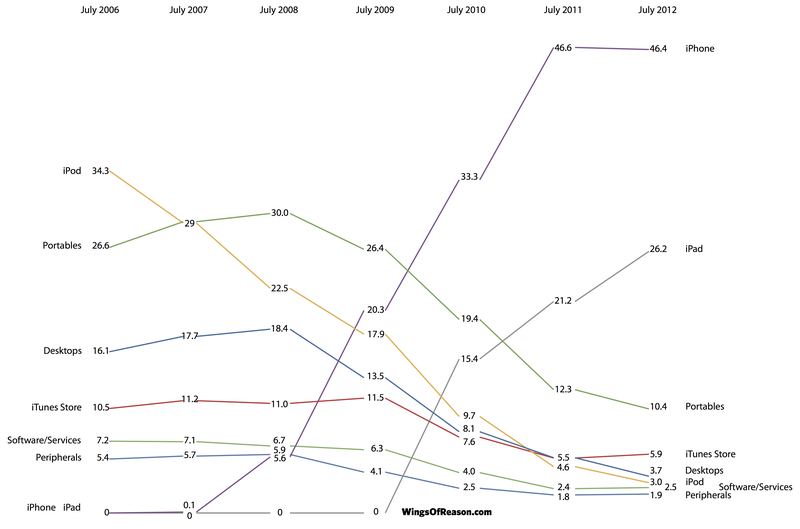 Devices in the WingsOfReason graph contains iPods, iPhones, and iPads. It’s no wonder that Apple has such high net profit and operating margins. An iPhone 4S, according to PC Magazine, cost $196 for the standard edition, $207 for the 32 GB version, and $245 for the 64 GB version. 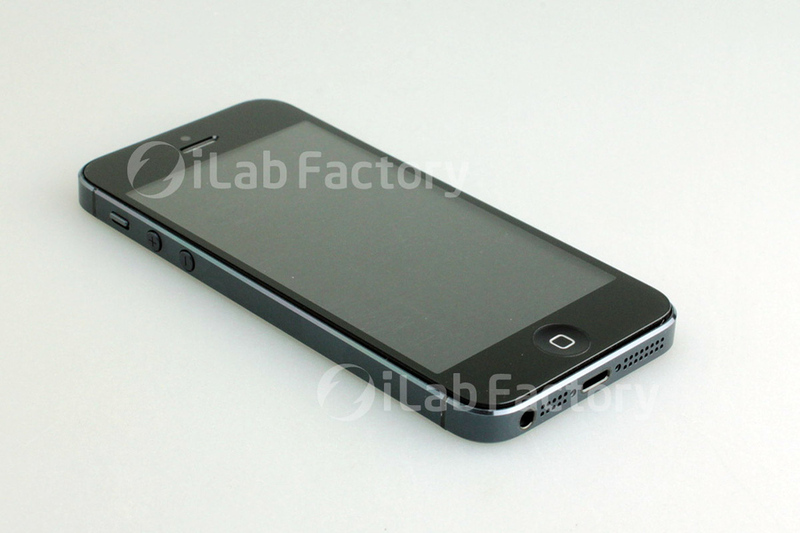 Apple sells unlocked iPhone 4S’s for $649, $749, and $849 respectively on their site. All of this leads to very healthy profits. No doubt a number of iFans will be anticipating the release of this year’s iPhone later in the fall and Apple should see a very healthy Q1 2013. However, many fear that Apple is reaching market saturation while Android remains king of the smartphone market. IDC just reported that Samsung is now the top smartphone manufacturer, giving some credibility to the idea. One would argue that it doesn’t matter with the iPhone’s healthy margins and they would be right. The problems come if iPhone users begin to convert to another platform, Android or even Windows 8. So far, that doesn’t seem to be happening, but some anecdotal evidence shows some users are getting tired of the OS whose look hasn’t evolved over five years later. One way or another, it’ll be interesting to see where the mobile market goes – both with smartphones and tablets. Microsoft is gearing up its Windows 8 offering with its Surface tablet and Android is continuing to polish its experience with Jellybean. ← Did Google Fubar the Nexus 7 Launch? Good way to represent your own post….i like your blog because of graphs that are understandable and informatic.